Though still too young to drive, a group of public middle school children nevertheless got an annual opportunity to work with Cooper Union engineering students on the school race car over their winter break. In a program started in 2010, every year a class from the Metropolitan Expeditionary Learning School (MELS) in Queens, NY visit the labs in the Albert Nerken School of Engineering to spend a day learning about mechanical engineering in a program that proves beneficial to everyone. This year, after breaking off into smaller groups on their arrival, the first team of MELS students packed into the brushed-steel elevators of 41 Cooper Square and descended two stories underground to the automotive lab. They followed mechanical engineering senior Kim Meehan through the heavy glass doors leading to the cluttered lab. The students marveled at the hefty steel and aluminum machines in the windowless laboratory, gathered around the Formula 1 race car Cooper students rebuild every year and race in a national competition. “So, what’s everyone’s favorite kind of car?,” asked Kim to the reverently hushed class. “My teacher told me that he didn’t learn about combustion engines until high school, and we’re learning it now in seventh grade,” says Josiah, a student at MELS who says he wants to be an aerospace engineer when he grows up. “I think we’re well ahead from most middle school students,” he adds. Upstairs on the ground floor, another group of MELS students gathered around mechanical engineering seniors Martin Lawless and David Tan in a brightly-lit classroom. The two bespectacled engineers carefully smeared a glob of translucent blue fuel jelly into the fuel compartment of a miniature model steam engine. Lawless then carefully lit the jelly with a match and slid it inside the engine sitting on a classroom table. Students from MELS leaned in with curiosity as the engine’s flywheel quickly accelerated and its exhaust pipe whistled out steam. MELS is a public middle and high school that promotes self-initiated learning and contact with professionals and college students. So a partnership with Cooper is a natural fit: exposing young minds to college-level concepts about science and engineering prepares them for advanced study while offering teaching experience and community engagement to the Cooper students involved. Cooper Union students, too, feel they benefit from the program. 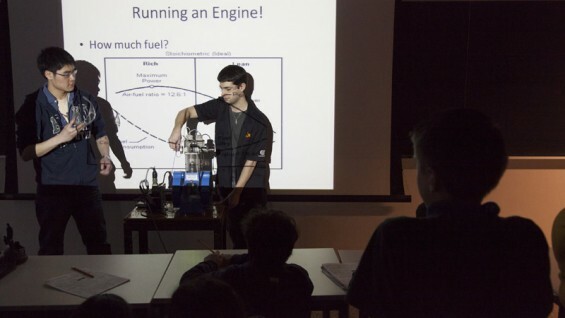 “It’s amazing to realize how we can be an influence on younger students who want to study and pursue the same things we’re pursuing,” says Spyros Korsanos, a senior mechanical engineering student and the 2013 captain of the Formula SAE team. Associate Dean of Engineering George Delagrammatikas recalls hearing about the MELS program from Sewall and being "instantly reminded of how my very dedicated middle school teachers taught me. After learning more about MELS from Jenna-Lyn Zaino, I also saw many interesting parallels between their teaching philosophy and what I do at Cooper Union in my design courses." Later this spring, Cooper students from the SAE team and Pi Tau Sigma will repay the visit and travel to MELS, where they’ll work with the same middle school class to construct fuel-cell model cars. The experience fits well with MELS’ curricular philosophy which emphasizes hands-on learning and sustainability. Constructing model cars helps budding engineers learn about the complex packaging and technical applications involved in automotive and mechanical engineering, as well as how to produce mechanical power from basic hydrogen and oxygen—the constituent elements of water.